Scrip is a term that means "substitute money." When you purchase scrip, you're purchasing negotiable gift certificates and prepaid cards that are used just like cash. You can use scrip to purchase everyday needs such as food, clothing, gasoline, and other essentials. With every purchase, you earn revenue for yourself and for our school! Because scrip is purchased up front, participating retailers offer substantial discounts to organizations that sell scrip. St. Martha's then splits that discount with anyone who purchases scrip from them with 50% of the discount going to the buyer and 50% going to the parish. The individual scrip credit that can be earned ranges anywhere from one to ten percent. Scrip is a popular fundraiser because families can earn revenue simply by making regular household purchases they would make anyway. Groceries, clothing, gifts, toys, salon services, gasoline, and many other items can be purchased with scrip. All it takes to make the most of the scrip program is a little adjustment to your shopping habits by planning ahead and buying scrip for purchases you make on a regular basis. Talk to your family members and you may be able to double or triple your scrip credit by having them purchase it, too! For example, most grocery stores in our area offer a 3% discount when you purchase gift cards through our scrip program. If you spend $100 per week on groceries, that translates to $156 per year in earned scrip credit which can be used to lower your tuition. Simply click on the following links for a list of participating retailers, along with the discounts they offer, or to print a scrip order form. The Scrip Office is located in the main office of the school building. Come in and talk to the scrip staff about how scrip can work for you! The phone number is 215-632-5821 or you can email us at [email protected]. Convenient pre-ordering is available through school with special pre-order envelopes. Simply fill out the envelope with the information requested on the front, place your payment inside and send it to school with your child. Please note that any scrip orders placed through school should be sent with your child on or before any given Friday and will be filled on Thursday of the following week. Also, some retailers, such as Home Depot, Lowe's, and Disney, offer larger denominations. Be sure to place your pre-order to use towards your next home improvement project or Disney vacation! Sunday: 8:45 am. - 1:15 p.m. The last day to pre-order for Easter is Friday, April 12th through school, Sunday, April 14th at the Scrip Office, or Sunday night by 8:00 PM online. The Scrip Office will be closed on Thursday, April 18th and Sunday, April 21st. We will be OPEN on Saturday, April 20th from 9:00-11:00 AM. 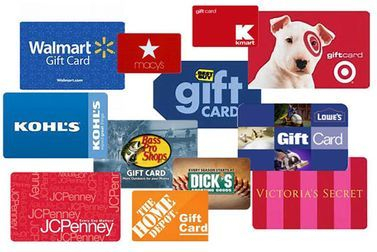 For a limited time, some of your favorite brands will offer low denomination physical gift cards. These cards are perfect for Easter baskets, graduation parties, or teacher appreciation gifts. The gift cards are available from April 6th through May 24th while supplies last. Simply fill in the amount next to the stores on your pre-order envelope or form.